I thought I saved this recipe from a book, so I took a bunch of pictures, intending to write a review. But it turns out it’s from Martha Stewart. I might as well share, since I’ve got a couple of reviews in the works, and this can serve as a dry run. 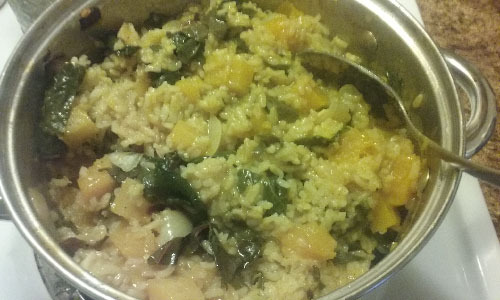 Here’s Martha Stewart’s Butternut Squash Risotto. Preheat oven to 400 degrees. In a medium Dutch oven or heavy ovenproof pot with a tight-fitting lid, heat oil over medium-high. Add shallots and cook, stirring occasionally, until soft, about 3 minutes. Add garlic and thyme and cook until fragrant, about 1 minute. Add rice and cook, stirring frequently, until opaque, about 3 minutes; season with salt and pepper. 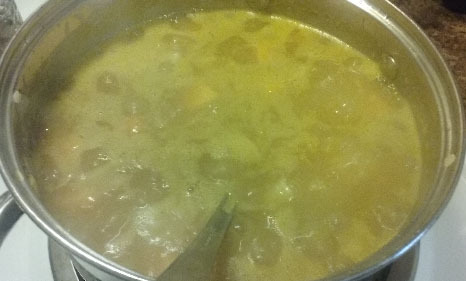 Add wine and cook, stirring, until completely absorbed, about 2 minutes. 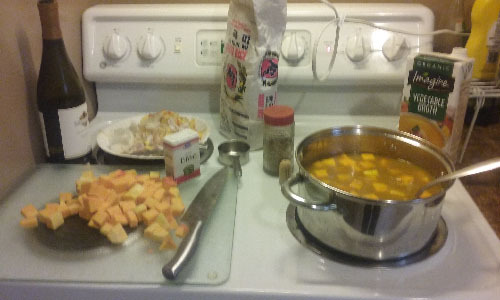 Add squash and broth; bring mixture to a boil. Stir in kale. Cover, transfer to oven, and bake until rice is tender and most of liquid is absorbed, about 20 minutes. To serve, sprinkle with Parmesan. 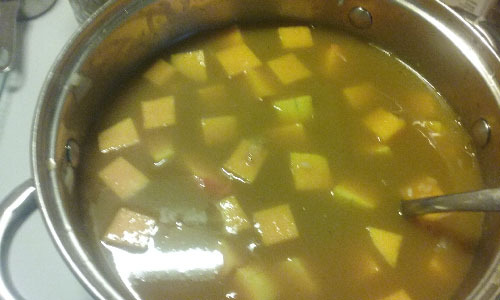 To save time, cut up the squash earlier in the week and refrigerate it in a zip-top bag. 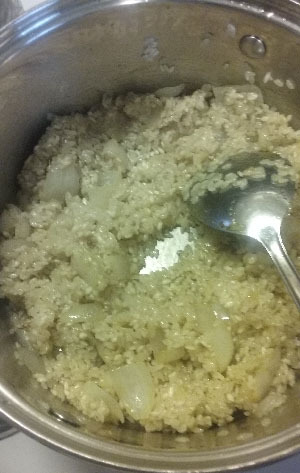 Onions, thyme, toasted rice, and wine absorbed. Too much stock? Who can say? I’ll find out, I guess. 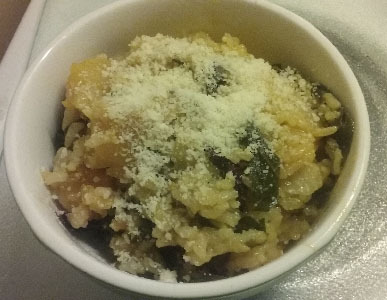 Final dish, topped with Parmesan cheese. 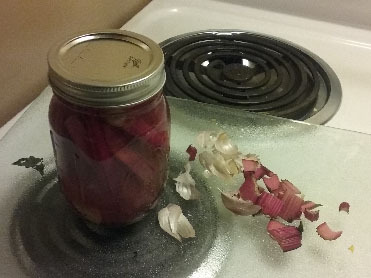 Not wanting to waste the kale stems, I turned them into pickles. So reviews coming up from Nom Nom Paleo, the Whole 30 Cookbook, and You Have It Made, along with notes on the Fall release cookbook webinar I attended.